In truth, there is no standard real estate agent commission for Australian property sales. Commissions differ from agent to agent as well as state to state, and in some cases, there are added fees on top of the commission charged. We have in-depth experience working with property sellers all around Australia, which has given us the knowledge to understand how real estate agents work and what fees are applicable from state to state. To help you navigate the minefield of rules and regulations, here is our definitive and comprehensive Australian Guide to Real Estate Agent Fees. 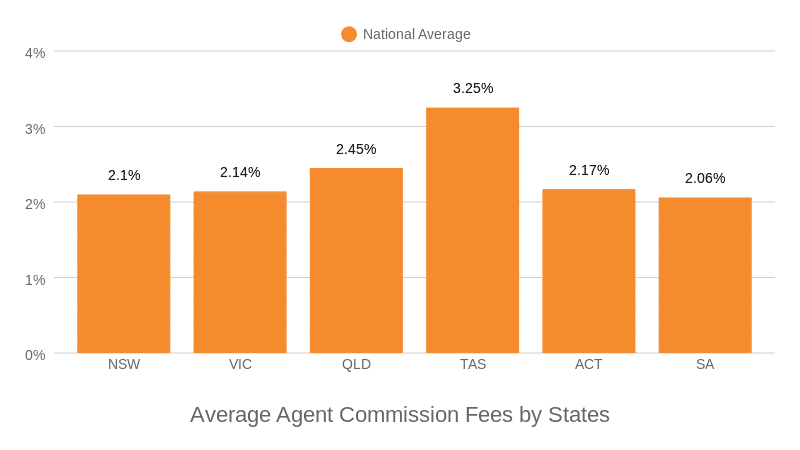 What is the Average Agent Commission Fees by State/Territory? All Australian states are deregulated. This means that real estate agents can set their own agent fee rate based on supply and demand. From a seller’s point of view, a small difference in the percentage can make a huge difference in savings, so it is imperative that you search for an agent who offers you the best deal overall. Along with the option of varying rates, you also have two fee structures to choose from. Generally speaking, when an agent sells your property, they will charge you either a fixed rate or a tiered commission rate based on the final sale price. Here is a breakdown of each option in more detail. The fixed fee (usually a percentage of the final dollar value) is based on multiple factors including the state percent average and an anticipated sale price. A percentage rate is a pre-determined one-off percentage that is payable to your real estate agent once your property sells. A commission is negotiable and is usually around 2-3% of the sale price, although it may be lower or higher than this range. A real estate agent cannot unilaterally alter the commission structure in any way once an agreement has been reached. High commission structures will generally include the price of advertising. Some companies have even started offering a flat fixed rate which does not alter according to price. This, however, is not as common with traditional agents. Commissions are put in place to act as an incentive for agents to get the best price for your property with percentage and tiered percentage rates rising in accordance with the final sale price. This does not mean that those who offer a fixed rate are not willing to go the extra mile. What it means is that you can be 100% certain of the fee which is payable, regardless of whether the price is lower or higher than your expectations. If you do find you are paying a higher rate than the average, then there should be at least some kind of marketing plan available to you to offset the additional charges. The tiered commission rate is a specific percentage of the total price that increases depending on the final sale price of your property or house. Like the fixed rate, it is agreed upon before the sale. Operating on a sliding scale which encourages agents to sell for a higher price, here is an example. Always confirm whether the percentage you are quoted includes GST. While fees do indeed differ from state to state across Australia, one of the most important things to remember at the outset is that real estate agent commissions are negotiable. This point may not be made clear at the beginning of the process; being forewarned is forearmed. What does that mean for individuals looking to sell their home? Know that it is well within your right to speak to multiple agents until you find one who offers you a deal you are comfortable with. You need to have the impression you are being charged a fair and honest price. Take into account the average for your area, the agent’s selling experience and knowledge of the market, the desirability of the property and what the agent is offering for their fee. Negotiate until all parties are happy with the price structure. This negotiation factor is often forgotten in all the intricacies of buying and selling a home, and many homeowners feel they are locked into a deal without any input whatsoever. While they may be negotiable, remember they are also mandatory. The only way you can avoid paying commission on a property sale is to sell your house privately via your own methods. When discussing the fee structure with your local estate agent, remember that a GST of 10% is payable on all commissions. In most cases you can assume a ‘no sale, no fee’ approach but it is always best to ask the question. Make sure that the agency agreement is plainly outlined, so there are no surprises when you are presented with the final bill. Some real estate agents may offer a lower commission structure but charge over and above for advertising fees, even if the sale does not go through. Other real estate agents charge you as and when additional costs arise. Know what you are signing up for before you put your signature on the dotted line. Sale commission may not be the only fee you incur with the sale of your house or unit. In addition to the advertising charges, you may also have to pay conveyancing and legal costs as well as moving expenses. Therefore budget accordingly. In 100% of cases, it is not necessary to pay any commission fees up front. There may be other charges applied to your property like advertising, but this will be charged separately from an agent’s commission. All commission fees are only payable once the sale of the house or unit is complete. Note that in some cases you may still have to pay if the sale falls through before settlement. This is known as an unconditional commission and may be part of your contract with your real estate agent. Should this happen, try to ensure that the buyer’s holding deposit is at least worth the figure of the commission, so you don’t bear the brunt of the cost unnecessarily. If your property is taking a long time to sell and you get an offer that is lower than what you and the agent expect, you can ask for them to renegotiate the commission in light of a quick sale. What is the Average Agent Commission Fees by the State? For ease, we have detailed how an agent’s fees are calculated and what the average percentage range is to sell your house or unit within Australia. NSW currently does not have any regulation for what can real estate agents charge to sell your property. You can always negotiate the final commission rate you pay to an agent if you are on a strict budget. The fee will vary depending on the location of the house or unit as well as the experience of the agent, the value of the property and the market at the time of sale. If the house is located in Sydney, you will find that agents’ commissions are more competitive due to a higher turnover of properties for sale. Our experience has shown us that real estate commission rates in NSW are approximately 1.8% to 3.5% with an average rate of 2.10%. Sydney-based sellers will look to pay between 1.8% and 2.5%; those in the regional area will pay around 2.5% to 3.5% due to lower prices and property turnovers. Based on an average commission of 2.10% in NSW, a seller will pay $10,500 for a property valued at $500,000. Sydney-based sellers will look to pay between 1.8% and 2.5%; those in the regional area will pay around 2.5% to 3.5% due to lower prices and property turnovers. Using the average state agent fee, we can actually calculate an estimated real estate agent commission based on a property sale price. Just enter your estimated property sale price or value to receive a rough agent fee you could expect to pay in New South Wales. For more information, just visit our NSW agent fee calculator page. Victoria currently does not have any set regulations on agent fees. You can always negotiate the final commission rate you pay to an agent or shop around to find one you prefer. The final fee will vary depending on supply and demand of the property, its location, the agency firm, their experience and the market at the time of sale. If your house is in Melbourne, you will find that agents’ commissions are more competitive due to a higher turnover of properties. Our experience has shown us that real estate commission rates in Victoria are approximately 1.6% to 3.0% with an average rate of 2.14%. Melbourne-based homeowners will look to pay between 1.6% and 2.5%; whereas those in the regional area will pay around 2.5% to 3.5% due to lower prices and property turnovers. Based on an average commission of 2.14% in Victoria, a seller will pay $10,700 for a property valued at $500,000. Using the average state agent fee, we can actually calculate an estimated real estate agent commission based on a property sale price. Just enter your estimated property sale price or value to receive a rough agent fee you could expect to pay in Victoria. For more information, just visit our VIC agent fee calculator page. Our experience has shown us that real estate commission rates in Queensland are approximately 2.45% to 3.0% with an average rate of 2.45%. Brisbane and Gold Coast based sellers can expect to pay between 2.45% and 2.75%; those in the regional area will pay around 2.5% to in excess of 3.0% due to lower prices and property turnovers. Based on an average commission of 2.45% in Queensland, a seller will pay $12,250 for a property valued at $500,000. Using the average state agent fee, we can actually calculate an estimated real estate agent commission based on a property sale price. Just enter your estimated property sale price or value to receive a rough agent fee you could expect to pay in Queensland. For more information, just visit our QLD agent fee calculator page. Western Australia currently does not have any fee regulations restricting what agents can charge to sell your property. You always have the opportunity to negotiate the final commission rate you pay to an agent. The fee will vary depending on the location of the house or unit and the agent’s closing ability. Our personal experience has shown us that real estate commission rates in Western Australia are approximately 2.5% to 3.25% with an average rate of 2.44%. Based on an average commission of 2.44% in Western Australia, a seller will pay $12,240 for a property valued at $500,000. Using the average state agent fee, we can actually calculate an estimated real estate agent commission based on a property sale price. Just enter your estimated property sale price or value to receive a rough agent fee you could expect to pay in Western Australia. For more information, just visit our WA agent fee calculator page. Tasmania is currently the most expensive state in Australia when it comes to real estate fee commissions. It does not currently have any fee regulations limiting the amount that agents can charge to sell your property. You can negotiate the final commission rate you pay to an agent to try to save a few dollars. The final fee will vary depending on the location of the house or unit and the agent’s knowledge of the market. $1104 plus 6.02% for sales between $10,001 and $50,000. For sales between $50,001 and $100,000, a fee of $3,512 plus 4.22% is appropriate. For properties that sell over $100,000, the fee is $5,523 plus 3.99% in commission. Based on an average commission of 3.25% in Tasmania, a seller will pay $12,240 for a property valued at $500,000. Using the average state agent fee, we can actually calculate an estimated real estate agent commission based on a property sale price. Just enter your estimated property sale price or value to receive a rough agent fee you could expect to pay in Tasmania. For more information, just visit our TAS agent fee calculator page. Canberra currently does not regulate what agents can charge to sell your property. You can always negotiate the final commission rate you pay to an agent. It is necessary to make commission price comparisons to ensure you get a good deal. The final fee will vary depending on the location of the house or unit, the market at the time of sale as well as the agent’s knowledge of buying and selling. Our experience has shown us that real estate commission rates in the Australian Capital Territory (ACT) are approximately 2.5% to 4.0% with an average rate of 2.17%. Based on an average commission of 2.17% in Canberra, a seller will pay $10,850 for a property valued at $500,000. Using the average state agent fee, we can actually calculate an estimated real estate agent commission based on a property sale price. Just enter your estimated property sale price or value to receive a rough agent fee you could expect to pay in the Australian Capital Territory. For more information, just visit our ACT agent fee calculator page. South Australia currently does not have any regulations on the amount an agent can charge to sell your property. You can always try to negotiate the final commission rate you pay to an agent. The final agency fee will vary depending on the location of the house or unit, property value, supply and demand and an agent’s knowledge of the market. South Australia has the lowest real estate commission rate in the country. Our experience has shown us that real estate commission rates in South Australia are approximately 2.75% to 3.0% with an average rate of 2.06%. Adelaide-based sellers will look to pay between 2.0% and 2.75%; those in the regional area will pay around 2.75% to 3.0% due to lower prices and property turnovers. Based on an average commission of 2.06% in South Australia, a seller will pay $10,300 for a property valued at $500,000. Using the average state agent fee, we can actually calculate an estimated real estate agent commission based on a property sale price. Just enter your estimated property sale price or value to receive a rough agent fee you could expect to pay in South Australia. For more information, just visit our SA agent fee calculator page. As you can see, the average commission varies according to each state with South Australia delivering the lowest average commission rate at 2.06% and Tasmania at the higher end with 3.25%. When you look at the difference between these two states, which is a staggering $6,000, it is no wonder that many people find it confusing. Here is a breakdown of the averages when it comes to the fixed commission fees. Again remember that this is the state average. You may end up paying more or less than the average commission specified by the local market. The final fee you pay will ultimately depend on your property, the agent, the market, the state average and inflation at the time of sale. Our comprehensive Australian guide can be used as your starting point for all things fee related and to help you determine your average commission based on your estimated home or unit value. The only way to increase your knowledge of the market average price is to speak to local real estate agents and determine what services they offer for the price they are asking. Even if you are confident in the ability of the agent, it definitely pays to compare multiple agents. Ask the agent poignant questions such as how many properties they have sold in your area, how long on average it takes them to sell a property, etc. to gauge whether they are truly the best agent for your needs. And of course, make sure you take the time to discuss their fee and commission structure and whether there are any additional costs involved. By asking the right questions, you can understand where your money is being spent. And don’t forget to negotiate. If you are unsure of any detail, have your solicitor review all contracts prior to signing to ensure that all clauses and fees are reasonable. All of this information will go a long way in helping you make an informed decision when it comes to selling your home. If you are considering selling your Australian-based property, make sure use the best real estate agent in your area, rather than just the cheapest. The right agent often pays for themselves many times over.